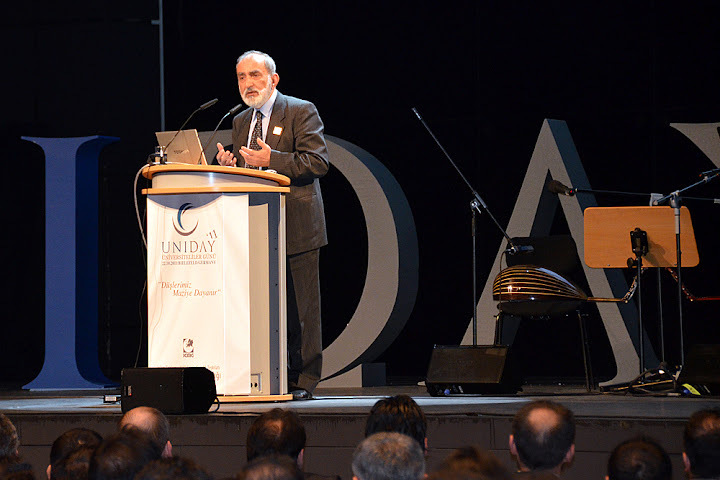 Professor Salim T S Al-Hassani, Chairman of the Foundation for Science, Technology and Civilisation (FSTC) and 1001 Inventions, was one of the keynote speakers at the Uniday (Students Day) conference on 22nd of October 2011 at Stadthalle in Bielefeld, Germany. 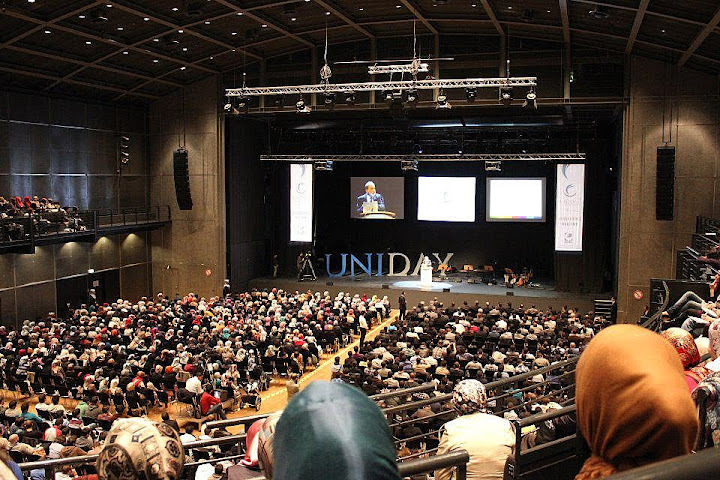 There were more than 3000 people at the event, predominantly young German Turks. Amongst the special guests that spoke at the event we mention Prof. Mahmud Erol Kiliç, world expert on Sufism, poet Serdar Tuncer and musician Göksel Baktagir. According to IGMG, the symposium is a formal meeting in which scholars and researchers gather to discuss topics ranging from current affairs to those of an intellectual basis. In particular, these conventions seek to define the process behind perceptions between "myself" and the "other." Also, elucidating the process of change within these perceptions by associating the hardships that Muslims living in Europe face on a daily basis with the theoretical issues causing these hardships. The slogan of the event was ‘Our dreams rely on the past'. Celal Tüter, Chairman of IGMG Student Department, explains that: "Earlier our slogan was "The future is intertwined with tradition" and "Those who do not repeat cannot renew". With steadfastness, we continue on this path of personal development. We strive to build our futures based on our rich traditions for it is within our broad history that we may find the horizon from which our future rises". In 1999, Professor Salim Al-Hassani and other colleagues founded the Foundation for Science, Technology and Civilisation (FSTC), and he continues to be the Chairman of the Foundation. FSTC is a not-for-profit educational foundation which aims to generate social cohesion, inter-cultural appreciation, and to promote science and learning as an alternative to negative and extremist behaviour. It does this by illuminating the shared scientific heritage of humanity, with its initial efforts centring on uncovering the very significant scientific contributions by the Muslim Civilisation. In its various projects, from books to lectures, seminars, exhibitions, films and electronic publications, FSTC is supported by a large network of historians of science, academics, writers and intellectuals. The projects carried on by FSTC are a compilation of stories that tell the history of science, technology and culture dating back to a thousand years, which school books, particularly in the West, lack. This thousand year time frame corresponds to a period after the fall of the Roman Empire to the beginning of the Renaissance in Europe, the period commonly known as the ‘Dark Ages.' This is a misnomer as this period was not really dark, and outside of Europe people were living in a golden age, in the sense that the age of discovery and science had never really ceased. This period also corresponds to a time when the Muslim civilization was flourishing. Yet, when we look at European sources on mathematics, astronomy, chemistry, physics, technology and medicine, we find a one thousand year gap. Does this mean that the readers who derive their knowledge from these sources suffer from a thousand years of amnesia? This amnesia is of a dangerous type, in that it both feeds the superiority complex, and introduces an inferiority complex among other nations, particularly within young Muslims. This gap in our history is destructive, rather than productive. Moreover, it will not help create or maintain peace in the world. Therefore, we are using the history of science as a new platform for dialogue. Our foundation is non-religious and non-political. Our researchers have chosen from among thousands of inventions to bring life into some of those that still are present in modern society. We have gathered together a large number of academics and experts in this field to ensure that the information we place in the public domain meet high academic standards. The significance of this new platform is its ability to use the roots and routes of scientific inventions to enhance social cohesion and to induce cultural inter-appreciation. For more information about these subjects, please visit MuslimHeritage.com. Prof. Salim greeted the cheering crowd in Turkish, German, Arabic and in English. Then he showed the 13 mins "Library of secrets" film which was interrupted with cheers and ovation. In his lecture, he pointed out how the 1000 years amnesia (in the minds of people and in school textbooks) encourage two dangerous trends in society. The first is that it engenders a feeling of superiority amongst westerners, and Europeans in particular, as they do not see any names from other non-European cultures in the books of science and technology which jump over 1000years of history, calling them the Dark Ages. At the same time, this 1000years amnesia is exported to other cultures, through translations of school texts, particularly to Muslims. This causes the reverse trend, generating an inferiority complex. These trends result in a huge gap between Muslims and the rest of society in Europe, and at the same time generate a gap between Muslim countries and Western nations. The gap breeds imbalance, hostility and misunderstanding. Prof. Al-Hassani questioned: Why shouldn't Muslims be allowed their right to own some of the great discoveries of Mankind? He addressed the audience by these strong words: "You people are the children of great men and women - scientists and inventors. If you look at the 1001inventions book and website you will see what I mean. You will find we are surrounded by their inventions and innovation. "I am sure if you tell this to your non-Muslim German colleagues, they will appreciate you, but more important is that you take those great people as your role models. They were principled people, they wanted to improve the quality of life through dedicated research and innovation. They were exemplary in their behaviour. They worked alongside non-Muslims. Christians, Jews and Sabeans worked shoulder to shoulder in Science and Technology (S&T) in the early years of Muslim civilisation." ?He continued by explaing that our Muslim predecessors in the Golden Age understood the essence of Islam through a very important verse which appears many times in the Quran. "Alladhin Amanu wa A'milu al-Salihat". They understood that Iman (Faith) is a private matter between a person and God but that Faith needed to be manifested in good useful work ('Amal Salih). Faith is like petrol, you need it for the car, which is required for useful work. People did not argue about which kind of petrol or which company they buy it from, but they were more focused on the movement and direction of the car. Iman is the input; useful deed is the output. Unfortunately many people have a very low efficiency. Little output but big input. In fact the Prophet (PBUH) warned against negative output, i.e. having done prayers, Quran reading, fasting, pilgrimage and so on, and yet on the day of Judgment, he appears in front of Allah with so many mischiefs against other people whom he has cheated, backbitten, robbed, lied to, etc. This individual would lose all the rewards of his worship and instead he ends up in hellfire. So it was really very simple. Connection with Allah (that is what Salat (–Prayers in Arabic ) means) and then one should do useful deeds. All good and useful deeds are done to improve the quality of life on this earth, whether within a Muslim or non-Muslim society. In fact an interesting example of the characteristics of a Muslim businessman is defined by the four letters in the Arabic word Tajir. T from Taqwa (God consciousness), A from Amanet (Trustworthiness), J from Jassaret (Courage) and R from Rahmet (Mercy). Prof. Al-Hassani commented by asking: "Please tell me if the Business and trade in the world had these qualities, would we have ended up in the economic mess we are in nowadays? So my message to you is: Learn from the past to build a better future. But the best lesson to learn is that through good behaviour, hard work in your studies, exemplary conduct in your employment, law abidance, cleanliness, trustworthiness, mercy, courage and God-consciousness, love for all humanity, respect for the opinion of others and emulate the best from all that your great great grandfathers and grandmothers had. If you behave along these lines then you will be respected, you will be loved, you will feel great and you will feel you have a role in this world. We remember Fatima Al-Fihri because she built the first university in the world in 859 CE in Fez. What would you like to be remembered by?"